Patients love to see reviews when they are going to select a new dental practice for the first time. In fact, 83% of patients claim that they no longer trust advertising, but most trust recommendations from users online. Furthermore, 72% of customers trust online reviews as much as they trust personal recommendations from real people. Google has reigned as ‘king of online presence’ for many years and has integrated reviews from other sites such as Groupon, Facebook and so on, into their review presentation. Google reviews are particularly weighty because they are directly linked to the search engine. Therefore it makes sense to think that reviews, or the lack there of, will factor into rankings especially when it comes to local SEO. Facebook is a very easy site to give reviews, especially if the people giving the review are your followers. 68% of consumers go to social networking sites to read business reviews according to a recent study. They usually do this before they transact with any dental practice they might have an interest in order to get a feel of what they can expect from the cosmetic services provided. People prefer to leave reviews on Facebook since they are on the platform frequently. In a survey, it actually beat both Yelp and Google in user preference! As mentioned before, Facebook reviews are also incorporated into the Google platform. Therefore with Facebook reviews, you are really getting two for the time and investment in one, so to speak. Facebook is really a platform for brand awareness, pre/postpurchase exploration, and branding support. Both platforms, Google and Facebook are very important to the success of any dental practice either big or small. They impact your dental SEO and ultimately make a difference in your online presence- your position on search listings. Reviews help you to rank higher in search results pages. Positive reviews will trigger clicks through to your website. A high click-through rate, coupled with good reviews, will act as trust signals to the Google algorithm, so your website will be featured towards the top of the results page. This will in turn improve and increase traffic to your website and, depending on your content and calls-to-action, can lead to a higher conversion rate. Reviews on both platforms will also influence your presence in Google Map listings. Reviews count towards 13% of the factors that determine your rank in the Google Maps. Reviews help your dental practice build trust and credibility, which are of vital importance in the customer decision-making process. As mentioned earlier, customers regularly consult online reviews before making a purchase or using a service- it is as important as word of mouth. Also, 74% of customers say that positive reviews make them trust a local business more (BrightLocal survey, 2016). Once potential customers come across positive reviews about your practice, products or services, it improves your chances of getting them to the next stage of the sales funnel (i.e. conversion). 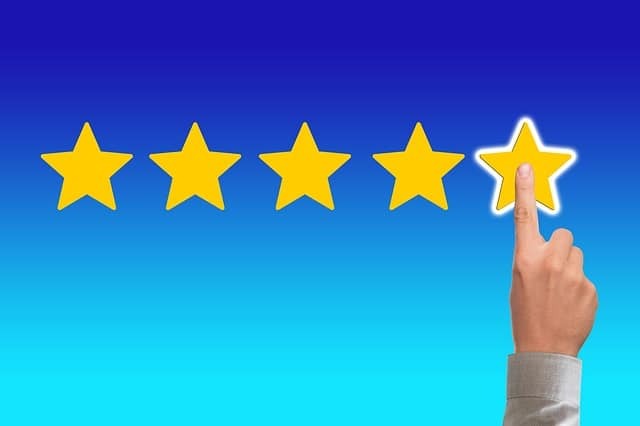 Reviews are also an opportunity for ‘earned publicity’ where customers that have enjoyed your dental services, or admire what your practice stands for, give you free publicity without you asking them to. This means you benefit from ‘mentions’ (of you) by your loyal advocates. Which is great for your dental practice social media marketing. Again, positive reviews will undoubtedly lead to click-throughs, which in turn can result in conversions and sales (online inquiries). In addition, the higher you rank on Google, the more potential new patient inquiries. A Harvard Business School research conducted in 2011, states that one-star increase in a restaurant review can lead to a 5-9% increase in revenue (www.hallaminternet.com). Some online reviews may raise concerns or suggest improvements related to your dental practice. This can be a good opportunity to resolve a patient’s dissatisfaction and/or improve business practices. Through your replies, customers can get to know you and build a rapport with you. Many customers enjoy knowing the person behind the business, and may become more loyal to you as a result. It would be unheard of to neglect such huge benefits attached to reviews especially since they are free of charge. Reviews from customers are free and having them published by the search engines or social media networks are free too. If you decide against welcoming reviews on network platforms, you are actively working against your practice reaching its full potential. Your competitors may already be on the wagon and be reaping these benefits at no extra cost to them while you lag behind. This means your competitors will have a better ranking than you and hence have better visibility on search engines. Your online existence, if any, will slowly fade away while your competitors attract more customers and bask in the glory of online success on all fronts- from SEO to increased ROI and so on. You will also lose out on building your digital footprint. Nowadays, weak existence in the digital world translates to no existence at all. Your strong existence means you will be with your customers wherever they are. You will be at their finger tips (due to their mobile device). The reviewing process does not end when you have received feedback from your patients. It is vital that you respond to at least some of the comments to show that your practice cares about individual experiences. Engaging with past and current patients will encourage more feedback, conversation, and a positive brand image. Rewarding patients after the treatment has ended will demonstrate dedication and will trigger loyalty. For dental practices, online reviews are one of the best direct channels for customer feedback. This is why it is important to make a point of telling your customers that their opinion is a huge contribution to the way you do business. Once you encourage your patients to leave reviews, it is essential to make sure that their efforts are rewarded with your attention. Monitor all reviews coming in and respond to everyone of them, especially the negative ones. With the exception of a complete absence of reviews, there is nothing worse for your dental practice’s social proof than negative reviews left without a response. Not only does this leave the audience without your perspective on the issue, but it can also come off as a lack of caring about what your customers think about your service. It is important to learn how to respond to negative reviews in way that leaves the reviewer and future customers satisfied. You may not be able to satisfy every disgruntled patient, but you should make the effort to show that feedback is important to you, and show that patients have a say in how your dental practice is run. Your online reputation can make or break your dental practice, as the Internet is often the first and last place potential customers go to find out more about you. Even the most reputable businesses or organisations have to deal with bad online reviews, posts on social networks, as well as blogs and other online forums. What is important to know is that it’s not so much the complaint or poor review that defines your reputation, but rather the way it is handled. When someone attacks your business, take some time to think about the situation. It is impossible to be pragmatic or genuinely apologetic when you are emotionally charged. But if you give yourself some time to mull it over, you will be able to see the situation with more clarity. Below are more steps to take when you receive a negative review. • Look into it: Some online reviews or complaints are not valid and some are. You will never figure out where you stand unless you investigate. Knowing what really happened will help dictate our course of action. Did your customer have a bad experience with the treatment or staff? Who was in the wrong? Find out everything about the situation before making any decisions. • Outcome of investigation: Is the complaint legit? Apologise. Is it Bogus? Apologise anyway. Apologise directly and publicly to those affected by responding to the comment on the site where you found the bad review. Let them know what you have done about it. In the event that the complaint is not a valid one, tell your side of the story and see what you can do to resolve the situation. You may not be able to correct something for one particular patient but reaching out publicly shows you care and that you are being proactive. One thing to keep in mind about online reviews and complaints: whether they are legitimate or otherwise makes little difference to the masses. A quick apology will do more for you than a denial of wrong-doing. Recently, Google announced the Google reviews can now be left without having to sign into a Google+ account. Reviews cannot be left anonymously, which addresses a major concern for review abusers, but this is a move to make it easier for users to leave reviews. Your organisation will benefit from higher quantity of reviews. More reviews mean better results for everyone involved and online platforms. Google is working hard to encourage more users to leave reliable reviews. As a result, it is certain that we will see even better integrations of reviews in Search Engine Result Pages (SERPS). They will be even more visible and interactive. Reviews will also be personalised. Because both the reviewer and the review-reader’s information will be available online, reviews of the future will be personally tailored to each reader. The same way Google ads and Facebook ads are already delivered to us based on what Google and Facebook know about our preferences, reviews in the future will pop up based on similar approach. Reviews from people with similar interests will show up. With these future developments in mind, it is obvious that online reviews are going to get even more important. It is paramount that you optimise your strategy now to attract the best possible reviews for your dental practice and be one step ahead of the competition.